Tamiya 1/35 Zimmerit Coating Sheet, King Tiger Production Turret Discounts Apply ! TAM12648 - Tamiya 1/35 Zimmerit Coating Sheet, King Tiger Production Turret. Simulating Zimmerit on military models using putty enhances the model's presence but at the same time it requires advanced skills and is time consuming. 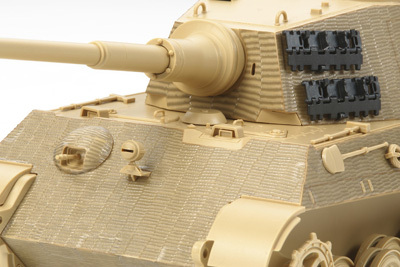 These stickers enable reproduction of Zimmerit on the German King Tiger "Production Turret." By using this sticker set it will allow novice modelers a way to add Zimmerit to their models without the stress of using a two-part putty. Specs and Features: Zimmerit Sticker Sheet x1, Compatible with 1/35 German King Tiger "Production Turret" (35164 and 35252).